Editor’s note: Sarah Mendelson is senior adviser and director of the Human Rights Initiative at CSIS. She served, until early last month, as a deputy assistant administrator at USAID. The views expressed are her own. If you knew nothing about Donetsk, Luhansk or Slovyansk before this spring, you likely now associate them with mayhem and lawlessness. Since Russian troops began amassing on the border of Ukraine and local separatists, supplemented by foreign fighters, have brought death and destruction, journalists and human rights organizations have zeroed in almost exclusively on those parts of Ukraine. Less examined and less talked about is the rest of the country, with its more subtle, and, I would argue, more important and unfinished story line. Security precautions were, of course, important given Russia’s occupation of Crimea and the violence in the east. But if the narrative from November through February was about the Euromaidan, the narrative since March has been largely about Putin, chaos and violence. There is so much more to Ukraine than that. Not all of Ukraine – not even all of eastern Ukraine – is engulfed in a “reign of terror.” Just next to Donetsk, in Dnepropetrovsk, where I was (as it turned out) deployed to observe elections by the National Democratic Institute, I found a peaceful, pleasant, Russian speaking town, with tree-lined streets, cafes, and out-door markets selling trinkets to tourists. Well-governed and calm, this region is filled with an intriguing population we all need to know more about: patriotic Ukrainians who are ethnic Russians looking to and identifying with the West, not the East. The Friday night before elections, sensing that the city was no more or less dangerous than say Dupont Circle, I checked into my hotel and immediately went out in search of blini. I found delicious ones as well as fashionable young Ukrainians enjoying the good weather. Stopping in the supermarket at midnight to buy bottles of water, I saw young people getting supplies for a night of festivities – just like young people anywhere. If elections in this part of eastern Ukraine were a good deal calmer than what we had feared, they were also a stark contrast to the many Russian elections I have observed in the last twenty years. In each polling station our team visited, after presenting our credentials, precinct election commissioners warmly greeted us, thanking us profusely for witnessing their historic day. Absent was the anti-American sentiment or suspicion about foreigners in polling stations that have marked many of the Russian elections I have observed. These people (most of the commissioners were women) were full of pride, chatting happily with me in Russian and grateful for the international guests along with the large mass of domestic election monitors. 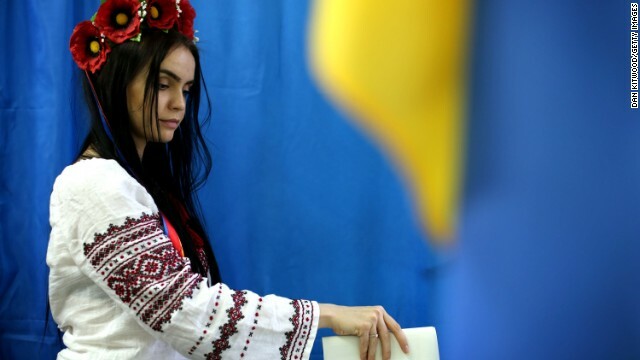 These Ukrainians had much to be proud of: in a matter of weeks, despite negative predictions, Ukrainians had organized a national election even as a hostile foreign power systematically tried to foil it. In fact, this was the first election in Ukraine, we were told many times, that occurred without the use of “administrative means,” a familiar term from Russia, where, for example, employees had to sign a petition for a certain candidate before they could receive their salary, or where travelers had to sign an endorsement before they could purchase a train ticket. In May in Ukraine, domestic monitors and international observers witnessed people showing up on “e-day,” calmly, many standing in long lines, and making their own choice for whom to vote. Now with the election over, turning the ideas behind the Euromaidan into reality is the challenge. If the Orange revolution in 2004 was about getting rid of Leonid Kuchma, Euromaidan 2014 was something more. As one young activist in Kiev explained, this was a “human rights revolution” for dignity, transparency, and accountability. The desire for open government had shaped this movement. In just a few weeks, despite all the chaos in the east, this young woman had been part of a group that had helped get five important pieces of legislation passed on issues such as budget transparency and freedom of information. Implementing the legislation will turn this movement into a government. Ukrainians, and friends of Ukraine, need to stay as focused on these governance challenges as the security situation in Donetsk, Luhansk and Slovyansk. What happens in the rest of Ukraine will actually determine Ukraine’s future much more than the thugs in the East. My wife come from Dnipropetrovsk oblast . We have family there . The truth is that this oblast is the kingdom of the oligarch Igor Kolomoyskiy , the owner of Privat Bank . He is paying Pravy Sektor who control all this area : people are afraid to talk or demonstrate . Same thing in Odessa where The government is using Pravy Sektor to keep the city quiet . I am myself from Ukraine. All the oligarchs in Ukraine are heads of different mafia groups. In 1990s they all were involved in criminal activities. For example Igor Kolomoyski nick name was Beni the killer. None of his active opponents in 90s were left alive. Timoshenko, Lavrinenko, Turchinov are all involved in the killing of Evgeny Sherban, who was shot dead in 1996. Tymoshenko have ordered the hit in 1996. WAKE UP! - US Asst. Secretary of State Ms. Nuland just "admitted" on CNN that the USA gave the new puppet Ukraine Prime Minister $5 BILLION dollars from US taxpayers and told him to let NATO and FBI and the CIA in to operate there and also the IMF in the country to begin harsh EU Austerity Programs there that are currently DESTROYING the poor EU Med countries like, Greece, Spain, Italy and Portugal.! - Go figure– they are using our tax dollars now when our own US Gov't is broke! What about sanctions against the USA & EU for invading Iraq, Afghanistan, Libya, Grenada, Mali, Vietnam, Korea, etc.?? There never was and WMDs that Bush claimed were there costing the lives of 100s of 1,000s of civilians and US Soldiers... Where was the EU, UN & G-7 then to stop Bush & Cheney's crimes ?? The USA & EU are hypocrites who beat their own anti-EU Austerity & Wall Street protestors! Biden, Kerry & Hillary Clinton have become! Dems and Republicans are out of touch with REALITY!!! is a mess run by low-life greedy immoral Politicians who are bribed and owned by Gangster Bankers, Criminal Corporations, and Wall Street Fraudsters!!! Good posting, paul. Thanks a million!!! Well put, paul. Thank you. @Paul john PhD. You sir are a liar and a swine. that goes to my troll and greg troll too. Yes, USA is biggest troublemaker on this planet. It is no wonder Russia and China ignore and have no respect for us anymore. Our leaders are crooks who have sold their souls for greed. If you're going to post something, try to make it accurate. The US didn't give $5B to the Prime Minister. The US employed $5B of aid to help a fledgling democracy establish the basic foundations of democracy. That amount of money is pretty insignificant – Yanukovych stole twice that much per year during his tenure. You're just a typical anti-Western crank – sees an American behind every bush, hands in every pot. It's pathetic. Yeah, this journalist tells what he's said to tell. I wonder if he was there and saw what indeed happens? In Germany we know that real terrorists are Kyiv and they kill civilians in Eastern Ukraine. CNN is loosing all the credibility, if they had any. Separatist didn't bring death and destruction, Ukrainian army did. Why US supports rebels in Syria, but not rebels in Ukraine? The right-wing thugs in Washington have no sense of decency, Alexander. They want to reduce both Syria and Ukraine to being no more than U.S. satellite states as Poland was to Russia for some 40 years after WW2. Their greed knows no end! I live in Moscow. I sell hotdogs. I play soccer. I am very good. I am in the Olympics. We will beat u dirty Americans next time!!! Folks, PLEASE, read above article and watch video and share it with anyone you know. There is text in English too. Ukrainian fascists government use prohibited weapons against civilians on South-East of Ukraine. Please, help STOP civil war in Ukraine. Thank you, Natali. I fully agree. Unfortunately, the right-wing thugs in Washington plan to pour more of our tax money into Ukraine to prop up the right-wing Kiev government, no matter how many people die in the process! Lol @ rupert...sounds like you are your biggest fan! One wonders whether Mrs Mendelson is related to Mrs Nuland or any of the oligarchs. In Ukraine a corrupt but democratically-elected Ukrainian president was removed and a government of equally-corrupt but non-Ukrainian oligarchs and unrich Ukrainian Fascists put in its place. They rely on murderous Right Sector thugs to punish Eastern Ukraine, and the few Ukrainian or possibly even foreign pilots who are willing to bomb not just administrative buildings, but also schools and hospitals. And British military officers have confirmed that bombs with white phosphorus have been used. Ukraine is precisely where Russia was under Yeltsin when it was ruled by about a dozen non-Russian Russians. In Ukraine we also have the rule of half a dozen non-Ukrainian Ukrainians, corrupt, vile and murderous at the same time. The writer is reported as being senior adviser and director of the Human Rights Initiative at CSIS and served as a deputy assistant administrator at USAID. That being so she must know the truth at what is happening in Dnieperpetrovsk. As regards Eastern Ukraine we know that neither American white phosphorus bombs, nor Steele's torturing Shiite police subdued the Sunni areas as we have just seen. And the oligarchs, ultimately , are as safe as the Colombian and Mexican drug barons were. With the notable exception that the drug barons were amongst their own kith and kin whilst the oligarchs patently aren't. This article is pure Western propaganda. It also shows that the writer absolutely does not now anything about the eastern Ukraine. Especially in Dnepropetrovsk where people are scared to show their feeling because of the Odessa tragedy where about 50 people were burn alive with the hidden support of the current Dnepropetrovsk governor. Remember Folks, all the news you see on TV was designed to be understood by a 12-year old. There are many lies told by your favourite newscasters. You might think some guy is the next Hitler from what you hear from your friends who watch the same news you do, but would you believe that none of us know anything at all about anything? Notice that CNN failed to even cover the recent vicious attack by right-wingers on the Russian Embassy in Kiev. There was significant damage, with several cars burned. Kiev officials - members of the U.S. installed junta - actually showed up and participated briefly. Nazi slogans were written on walls. But CNN chose to ignore this serious incident, more evidence that America's foremost TV news network has become largely a propaganda outlet. And this article certain contributes to that conclusion. Killing Civilians in Eastern Ukraine: Ukrainian Democracy? The mainstream media of the West-LIES blatantly. 11/4/2016 @ 08:43:31: Thanks for the post globalpublicsquare.blogs.cnn.com! Getty Images4Alex Iwobi has made his choice...and it's not Mesut Ozil or Alexis SanchezNo way. Getty Images3John Terry is wanted by Shanghai Shenhua in the Chinese Super LeagueBlues bosses would waive any transfer fee for their long-serving defender and the whopping ￡11.